Penicuik met Currie & Balerno in the semi-final of this double rink knockout competition on Friday (26 Jan). The Penicuik teams were (1) Andrew Lambie, Jim Ramsay, Alex Moir, and John Glidden; and (2) Dave Anderson, Ken Hunter, Dave Carr, and Craig Brown. Penicuik got off to a good start with both teams playing well and taking early leads. Team 1 arguably had the stiffer opposition but held their ground until the latter stages of the contest and finished 3-6 against. Team 2 had established a 7 shot lead after 4 ends, but regrettably surrendered the same number of shots in the next 4 ends to end their game level, the overall contest went to the last stone. Congratulations to our opponents on upping their game even more to beat Haddington in the final. Penicuik met Athlestaneford in the semi-final of the Rink Championship qualifier at Murrayfield on Saturday (27 Jan). Our team was Jim Ramsay, Dave Anderson, Ken Hunter, and Andrew Lambie. Athelstoneford exerted pressure in the first end, and only a well judged shot by Jim saved the day for Penicuik. It turned out to be a very tight game, but Athelstaneford established a 4-3 lead after five ends, with the sixth end being the last end. The Athelstaneford Skip played a stone just beyond the centre point of the pot lid, Jim responded with a draw to that stone to take shot, but unfortunately it was not quite locked in , and a fine strike by his opponent took the day for Athelstaneford (5-3). This entry was posted in Competition, External on January 29, 2018 by captainken45. The annual West Linton Challenge was contested on Wednesday 24th January with Jim and Pam Ramsay, Ronnie and Christine Hope, Andrew and Janette Lambie and Dave and Liz Anderson representing Penicuik against the West Linton squad of Neil Calvert, John Dykes, Jan Murray, Anne McDiarmid, Chris and Marie McDonald, Eric Leslie and Lesley Glidden. The games were played in the best of spirits as was evident by the continuous banter on sheets 1 and 2. The first ends went in favour of Penicuik with 1 shot each, with West Linton taking 1 shot each in the second end; team Ramsay forged ahead with a 5 in the third whilst team McDonald recorded 2 against the hammer. The fourth ends went with the hammer, team Calvert gaining a single and team Anderson 3 shots. Team McDonald scored singles at each of ends 5, 6, & 7 giving West Linton a 6 shots to 4 advantage, however with team Calvert getting a single in end 5 and team Ramsay gaining 2 and 1 in ends 6 & 7 Penicuik won that game by 9 to 3 making the aggregate score for the match 13 shots to 9 in favour of Penicuik so, following a meal and refreshments, President Jan presented President Christine with the West Linton Challenge Trophy. Many thanks to all who participated in this very sociable fixture which has become a firm favorite with both clubs, long may that continue. This entry was posted in Uncategorized on January 26, 2018 by captainken45. The final of the first Hurley League was played on Thursday 18th January between teams Ramsay and Jacobs. Jim’s team had won Section 1 and then beat Dave Anderson’s team in the semi final. While John’s team was second in Section 1 and then beat Walter Brown’s team in the semi final. So the final was a rematch of their Section 1 game, which had been won by Jim’s team. On the night, Team Ramsay was Jim Ramsay, John Glidden, Chris Parry (subbing for Jim Cowper) and Margaret Dalgleish. Team Jacobs was John Jacobs, Margaret Carr, Christine Hope and Elaine Lambie. Team Ramsay were quick to find the weight of the ice and got off to a flying start with a 4, followed by a 3. Team Jacobs then pulled back with a single at the 3rd end. At the 4th end, Jim tried a difficult raise on his own stone to prevent losing a one but was too tight and lifted a blue to into his yellow to give away a 3. 7-4 and the comeback was on. However, team Ramsay played the next 2 ends very well, taking singles at each end. The bell went as John’s last stone was half way down the ice, resulting in a 6 end game. Well done to team Ramsay for their 9 – 4 victory and winners of the Hurley League. This has been a new format for Penicuik competitions (the same format as the Tennis O2 Finals). The sectional leagues produced some good games, and nearly all the games affected the final positions, before the “cut and thrust” of the semis and final. Hopefully, we will continue the competition in the future. This entry was posted in Uncategorized on January 21, 2018 by captainken45. Penicuik met Haymarket in their initial round of the Henderson Bishop qualifying tournament at Murrayfield on 6 December. The team was skipped by Liz Anderson, who was supported by Margaret Carr, Janette Lambie, and Pam Ramsay. Haymarket won the game 8-3. Having got a bye in the 1st round, Pencuik – Iain Scott (skip), Keith Morris, Roger Scott & Craig Brown – met SIAE in the second round. Penicuik started well, putting SIAE under pressure, including forcing them to draw against a 4 (in 3rd end). Ultimately Penicuik were unable to convert the early pressure into a score, setting up a tight match. Whilst Pencuik scored a 2 in the 4th end, the momentum was firmly shifting toward SIAE. Ends 5 & 6 saw SIAE scoring 2 in each, dealing with the “pressure shots” better than Penicuik. The 7th end saw a pressure save from Penicuik from another SIAE score with a last stone draw to the 4 foot, but this was too little too late. Hands were shaken at the end of 7 ends, 6-4 to SIAE. Penicuik and Merchiston curling clubs played out a thrilling game to commemorate the 203 year link between both clubs. On rink 7 ice conditions were fast and swinging on all sides. Penicuik line-up: John Jacobs (skip), Iain Scott, Robert Beaton and David Gillespie. Merchiston lined up with Chris Morrison (skip), David Cunningham, John Wood and Ross Angus. Both teams started well, but Merchiston playing aggressively were lying four as John played the final stone of the first end. Needing a dead draw to the inner four foot, some strong sweeping brought it home for a welcome single1. Penicuik with excellent shot playing from front end managed to take command of the second end after a well-placed early guard and took a 3 – 0 lead. Back came Merchiston with scores of two in the next couple of ends to edge ahead 4 – 3. Getting shots in and guarding was the way to play. Starting the fifth end, Penicuik with strong draw play started building up a few stones at the front of the house behind a couple of guards, with Penicuik lying 4, a key shot from Merchiston’s Third, David, was on a great line to cut shots, but had an unfortunate pickup causing it to swing and tap in another shot for Penicuik. Another guard was played and then Chris managed to raise a Merchiston stone in to reduce the damage to 3, a small gap offered the chance of a take out for a possible 6 which, again with strong sweeping controlling the shot, was successful in making a gain of 6. Looking good at 9 – 4 up, with two ends left, Merchiston weren’t finished, well placed draw shots set up the chance for skip Chris to bury another shot behind a guard for 3. Penicuik skip John switching hands played short on a good line, Chris took advantage and drew another shot on for a four to reduce Penicuik’s lead to 9 – 8! 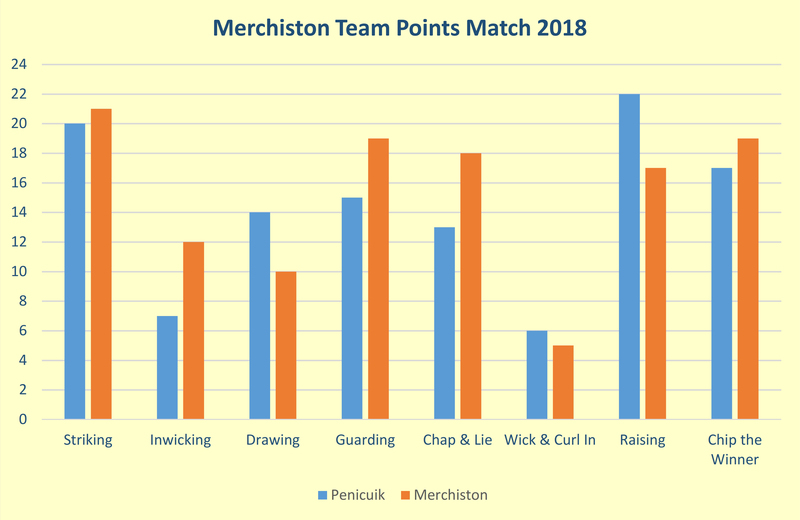 In a tense and exciting final end, Chris drew to the four foot with his last stone, half covered by a guard to leave Merchiston lying two for game with last stone to come for Penicuik. Looking good for a while, but started swinging and again needed strong sweeping to come into house, clipping a short stone and just made it far enough for second shot! with the game ending 9 – 9. Everyone agreed that they had thoroughly enjoyed a very exciting game with some fabulous shots being played by both sides and that a draw was the right result. The game was played in a great spirit throughout befitting of the long standing friendship between the clubs. Penicuik (Jim Ramsay, Dave Anderson, Ken Hunter, and Andrew Lambie) met Musketeers in the second round of this tournament on Saturday afternoon. Musketeers took a single in the first end, and then stole a single in the next end to go two up. Penicuik then took a single in the third end, and stole another single in the fourth end to make it 2-2. The Musketeers ominously took singles in the fifth and sixth ends for a 4-2 lead going into the last end. However, Penicuik managed to scrape a two in the seventh end to peel the match. So on to the sudden death finish of the skips drawing to he house. Jim played first and drew to the back of the four foot, and fortunately for us the opposing skip’s draw was just marginally heavier. This was a good game played in the best of spirit by the participants. This entry was posted in Uncategorized on January 15, 2018 by captainken45. Dave Anderson, Dave Carr, Liz Anderson and Jean Noble headed west to Braehead to play a return social match against Robbie Wishart’s Partick rink. We struggled to get the measure of the ice early in the game and went 4 shots down after 2 ends but we rallied in the third with a single shot and the come-back continued with a 2 in the fourth then a 3, a 2 and a single in the last to win the game by 9 shots to 4. As in last year’s game the teams rotated after each two ends which made it an interesting and very enjoyable game played in excellent spirit. Many thanks to our hosts Robbie, Duncan, Heather and May for their warm welcome. Despite a dodgy weather forecast, fourteen hardy souls heeded President Christine’s call and congregated at 10 a.m. in the car park at the Lowrie’s Den entrance to the Penicuik Estate for the second annual “Pond Walk” on Saturday 30th December. In fact, although chilly, the weather was bright and sunny, and after a fulsome exchange of season’s greetings the club historian and raconteur, James A Cowper, led the way into the beautiful snow-covered estate, the historic home of Penicuik Curling Club. GRADE B LISTED – a key ‘eye-catcher’ in the Designed Landscape. Designed by Sir John Clerk and built between 1748 and 1750, the tower was conceived both as a belvedere, (a structure designed to provide a beautiful view), as well as a working dovecot – a ﬁne example of beauty meeting utility. Rising to a height of some 16m, the circular stone tower comprises inner and outer drums, spanned by a ﬂat roof of overlapping stone. The inner drum houses a stair giving access to wide circular passageways with the upper chamber providing 1,356 brick nesting holes for pigeons. The view from the top of the tower over the Designed Landscape and rural Midlothian is magniﬁcent and it is our ambition to return it to visitors by 2018. So there! We were all correct! Our walk continued into the Estate at a leisurely pace and, with Sir Robert Clerk’s kind permission, we made our annual pilgrimage to the High Pond, complete with an inviting, although disappointingly thin, cover of ice. There, we reﬂected on the occasion of the ﬁrst ever Grand Match in the universe held on 15th January 1847. Following Jim’s new map, (c.1880), we deviated from our normal route and struck out to view the famous Fairy Circle. This may have been famous in the 1880’s but has considerably less appeal now; however, Margaret C. enthralled us with her personal, somewhat worrying, tale of the time she and her two companions were enticed into the nearby mansion by a strange old man! Jim’s carefully planned route would have had us carrying on across the Cornton Burn to the Hurley Pond, but we were thwarted in this by a group with guns and had to be content with a short stroll around the iceclad Low Pond to Penicuik Curling Club’s H.Q. and spiritual home, the Curling House. There, whilst we imbibed hot mulled wine and “Rusty Nails”, and sated our appetites on a splendid variety of warm mince pies, Hon. Pres. Jim read Charlie Wilson’s reﬂections from the club minutes of 1916; “…members used to complain of the long road to the pond but oh, I remember the day when I did not think it long, when with a palpitating heart I would wend up by the old Roman Bridge and the saw mill, with the smell of new cut logs in one’s nostrils, and listening to the rumble of the stones. But when the scene burst upon one’s view, the pond like a mirror sheen, and the roar of a curling stane war, it was glorious, it was invigorating, it was elevating.” Suitably invigorated and elevated by Jim’s oration, the party then headed along the Esk, past the site of the saw mill and the restored Roman Bridge, and thence upwards to the stunning Ladies Walk and home. Jim’s “Reﬂections on Hurley Cove” will wait for another year. This entry was posted in Uncategorized on January 1, 2018 by captainken45.